How would you like a chance to win $100000 cash prize, Vacation, free food? 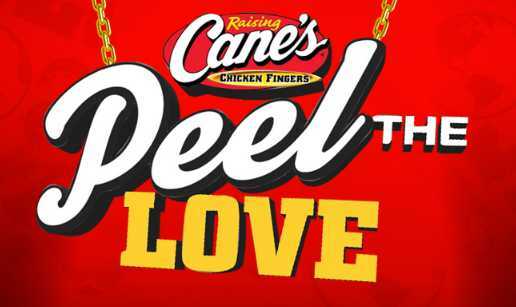 Enter into the Raising Cane’s Peel The Love Game at peelthe.love now through March 17, 2019 for your chance to win grand prize of $100,000 cash and other great prizes such as 25 Piece Chicken Finger Tailgate, Cane’s Tailgate Package, Cane’s Bedroom Set and more. How To Play: There are three ways to enter the Raising Cane’s Peel The Love Game, 1.) Instant Win Game, 2.) Collect To Win Game & 3.) Online Instant Win Game. To play Instant Win Game you will need Game Pieces & for Online Instant Win Game you will need Bonus Code.!! How To Get Raising Cane’s Game Piece? Make a purchase of a 22 oz. or 32 oz. fountain drink in a promotional cup (“Promo Cup”) at any participating Raising Cane’s restaurant during the Restaurant Promotion Period, while Game Sticker supplies last, or you can also get free Game Sticker by submitting a request for a free Game Sticker by mail. How To Get Raising Cane’s Bonus Code? You can receive a Game Sticker with the purchase of a Promo Cup which contains a Bonus Code. Vie email if you are a Caniac Club Member. Request a free Game Sticker by mail. Purchase a Promo Cup, then use the QR Code printed on the cup to download and play the Lemon Launch mobile game app. Download the free Raising Canes Peel the Love mobile application during the game period to print out the free Lemon Launch target and play the Lemon Launch game. Instant Win Game: Peel back the Game Sticker to reveal the Game Pieces. If a Game Piece states a food, beverage, or other Instant Win Prize, then you have won the designated prize on the Instant Win Game Piece. Collect To Win Game: (Grand Prize) Peel back the Game Sticker to reveal the Game Pieces. One (1) Game Piece will reveal a letter in the phrase C A N E S.and you must collect one of each letter to spell the phrase C A N E S for a chance to big prize of $100,000. Online Instant Win Game: During the game period go to this link:raisingcanes.com/peel and follow the on-screen instructions to register with your email address if it is your first visit (or login with your Registration Email on subsequent visits) and enter your Bonus Code for a chance to instantly win an Online Instant Win Prizes. Prize: 25 Piece Chicken Finger Tailgate (No. of prize available: 3674), Lemonade Jug (1 Gallon) (No. of prize available:8572), THE BOX COMBO (No. of prize available:91758), Tea Jug (1 Gallon) (No. of prize available: 97,802), 2 oz. Beverage (No. of prize available: 1,921,530), Crinkle-Cut Fries (No. of prize available: 2,177,734), Chicken Finger (No. of prize available: 2,512,771), Texas Toast (No. of prize available: 3,629,557), CANE’S SAUCE or Honey Mustard (No. of prize available: 1,256,385) and One lucky grand prize winner will win $100,000. Total ARV of all prizes is: $16,224,576.656.!! When To Enter: This sweepstakes entry begins at 12:00 P.M. ET on 12:00:01 a.m. Central Time (“CT”) on January 3, 2019 and ends at 11:59:59 p.m. CT on March 17, 2019. Who’s Sponsor: The Raisingcanes.com Peel The Love Game is sponsored by Raising Cane’s Restaurants, LLC, 6800 Bishop Road, Plano, TX 75024-4274.